I’ve promised not to stray far outside the confines of horse racing for these musings, but how can I talk about the two people that head up this week’s offering without a mention of Arsenal and Chelsea football clubs?, writes Tony Stafford. The pair concerned are linked even more closely than my own emotional allegiance to the former. The first, Neal Wilkins, sadly died last week after a long, debilitating illness. The other, Alan Spence, was yesterday celebrating a fine win for Josses Hill in Huntingdon’s Peterborough Chase the day after Chelsea’s confirmation at the top of the Premier League. Many in racing will have known Neal, with whom I worked for a couple of years at the Press Association where he was a typist, but one always destined for higher things. Later he was the public face of Victor Chandler as their on-course rep, always getting in his ante-post television quotes with the same alacrity as Mike Dillon for Ladbrokes. As another contemporary, Geoff Lester, said in last week’s story that recorded his death in the Racing Post, “Neal was always first to the bar and last to go home”. He certainly enjoyed a glass of wine as well as he stoically endured what he, like many Arsenal fans, regarded as under-achievement by his team. Alan Spence was once a director of Chelsea in the Ken Bates days and remains an honorary Vice President – often promoted to Chairman by Derek Thompson when his horses go to post. My boss Raymond Tooth’s Tommo handle is “the most expensive divorce lawyer in the country” – maybe I should ask him if that’s true? During the Flat season, Spence’s horses, including a few shared with son Michael and friend Peter Hargreaves, won more than 20 races, with Profitable collecting the Group 1 King’s Stand Stakes for the Clive Cox stable. Profitable will not now appear in the Godolphin colours in next Sunday’s Longines Hong Kong Sprint after a deal was announced last week, but few horses will have better lived up to their name. I met Neal Wilkins soon after a brief association at the Press Association with Claude Duval, whose recent retirement was accompanied by a bit of a shirty send-off in these parts. Claude had a fair old name to live up to – the 17th Century version is described as the “most gallant and courteous rogue” who earned his money robbing stagecoaches on the approach to London, in Holloway, between Highgate and Islington, in other words, outside the Emirates stadium. While unable to resist the repetition of a one-time unflattering headline, I sent Duval off by ridiculing his final scoop, scoffing at the suggestion that Paul Hanagan was to lose his job with Sheikh Hamdan Al Maktoum. Well now he has, so hats off to the most courteous and dashing of journalists, whose retirement should be rather happier than his predecessor’s – he was hanged in Tyburn in 1670! Alan Spence will have no more than four horses to jump in the winter – Soldier in Action will aim at the Triumph with Nicky - but obviously Josses Hill will be the focal point with possibilities of Cheltenham Festival success after placed efforts behind recently-deceased Vautour (Supreme) and Un de Sceaux (Arkle) in 2014 and the following year. He’ll want to avoid the latter, probably running in the Ryanair over 2m5f, but just a cursory look at yesterday’s action at Fairyhouse shows just how strong the Mullins and Elliott teams will be next March. Un de Sceaux showed a different side to his always-evident talent when forsaking the customary early lead under Ruby Walsh in Saturday’s Tingle Creek Chase at Sandown, leaving that role to Gary Moore’s speedy Ar Mad. Once that horse’s exuberance had been pricked in his first run after a layoff, Un de Sceaux settled down for a battle with Sire de Grugy up the final hill and over the last, coming out narrowly on top. With Sprinter Sacre – on parade again – out of the equation, the pair will be among the major contenders for the Queen Mother Champion Chase. They may only be keeping the seat warm, though, for Altior. Nicky Henderson’s gelding remains a hotpot for the Arkle after a second workmanlike novice chase win in the Henry VIII Novice Chase. Altior beat Charbel by six lengths in a rare case of two Irish- and Flat-bred animals contesting a major jumps race. There were still more than enough French imports on show on either side of the Irish Sea. Aintree’s two big chases, the Becher and Grand Sefton, over the National fences, went respectively to Vieux Lion Rouge and As de Mee, both French-breds. Vieux Lion Rouge, seventh in this year’s Aintree spectacular, came late and fast under Tom Scudamore to get the Becher on the line for the David Pipe team. As de Mee, ridden by Sean Bowen for Paul Nicholls, is jointly owned by the Stewart family of Big Buck’s fame and Dame Judy Dench, who when work allows, likes an evening at Sandown. I’m sure the next time she goes to Esher, she’ll love the newly-enlarged and improved owners’ room, just in time for Peter Jensen’s takeover as Chairman. The best story from Aintree though was the excellent first post-wind-op effort of Many Clouds who impressed in the Betfred-sponsored Listed Chase over 3m1f. He was well on top at the finish and the Oliver Sherwood-trained 2015 National winner will be the one to beat again next April. 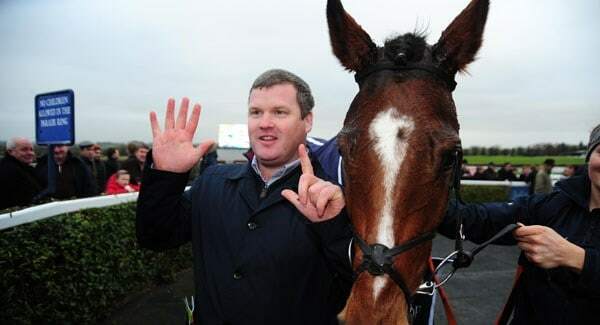 In Ireland yesterday, the potential state of things to come where Willie Mullins is concerned was brutally revealed when Apple’s Jade, his wide-margin Aintree Juvenile Hurdle winner, now with Elliott, brought to an end the winning run of 2016 Mares’ Hurdle champion, Vroum Vroum Mag. In ten previous starts for Mullins, shared between hurdles and fences, Mag had been unbeaten, but Apple’s Jade showed great resilience to hold her off by a short head in the Hattons Grace Hurdle. Other notable winners there were Landofhopeandglory, completing a hat-trick for Joseph O’Brien in the Juvenile Hurdle; and Airlie Beach, who made it seven out of seven for Mullins in the Royal Bond Hurdle, in which Ruby Walsh chose fourth-placed Penhill. Airlie Beach won once last year in a bumper. He made his hurdles debut in mid-July and less than five months later has made it six-in-a-row over jumps with this smart performance. Bapaume, second to Landofhopeandglory in the Juvenile Hurdle, looks one to follow. Amanda Perrett is one of Alan Spence’s trainers and she supplied him with three 2016 successes with the handicapper Frozen Force. Amanda and husband Mark, a high-class and stylish jockey in his riding days, always enjoy the occasional foray over jumps and at Huntingdon they sent out the former Juddmonte-owned Glaring to win first time at 33-1. Glaring’s 2016 campaign on the Flat since his 50,000gns acquisition from Prince Khalid Abdullah, a long-standing owner with the stable, was modest. But considering he started with a rating of 108 based on French placed form in Group company, dropping to 93, it seems hard to understand his price of 33-1 in a novice hurdle. Spencey was there and I bet he backed it: after all it was his weekend!